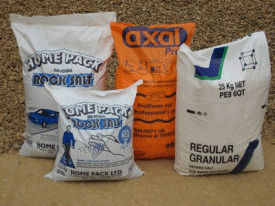 Homepack 25kg Water softening salt comes in both Granular and Tablet form. Ideal for dishwashers and laundry applications. During winter months we offer Rock salt in both 12.5kg and 25 kg bags.